Since the beginning of AROLLO Boots in the year 2008 we always thought international. Our goal is to reach customers and fans of Overknee Boots from all over the world. From the beginning, we have not focused our activities solely on Austria and Germany. With our first own online shop, we have created the conditions for international sales.The challenge now was to make our international customers aware of us. To do this we started in 2011 with intensive marketing in the social media. We created accounts on Facebook, Twitter, Instagram and Youtube. Also Pinterest is a good place to promote our products. Very soon we reached thousands of followers and subscribers. In the first years we sold somtimes some Boots outside from the European Union. From that point in time when we used social media, international sales increased. Very quickly, we had customers from all over the world. Not just in the European Union. We also managed to attract customers from America, Asia and Australia. 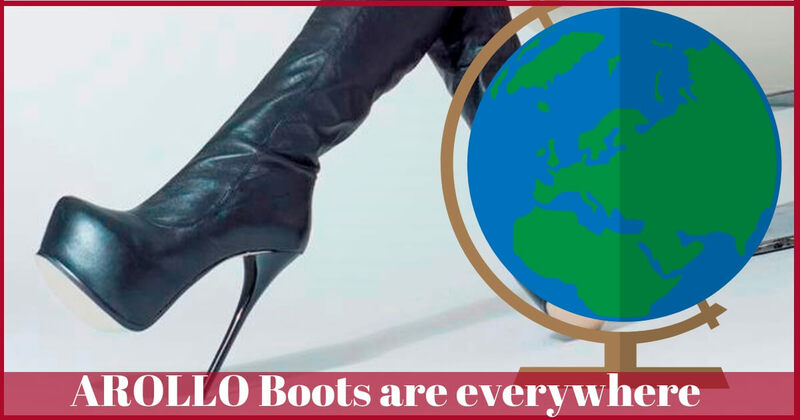 Today, AROLLO boots are sold in over 60 countries around the world. Many satisfied customers from USA, Canada, Russia, Australia, all European countries and even China and the United Arab Emirates are the result of good quality and excellent service. Delivery to any country in the world is free at AROLLO. With our delivery partner, the Austrian Post, all shipments are deliverd quickly and reliably. All items are insured and for delivery outside of the European Union equipped with all necessary papers. Since we put the new shop online in the summer of 2018, we offer a total of 6 languages. Besides German we present the whole content in English, Spanish, Italian, French and Russsian langugae. Now, we also reach customers who do not speak the English language. The entire conversation that is necessary for a purchase of AROLLO boots can be done in these languages. If you have any questions about our products, you can use the Live Chat in your mother language, or write us an E-Mail, or just give us a call. We are right here for you to take care of your questions. It’s best to test us. You will find out that AROLLO does not have an above-average customer rating for nothing.